Jasper and I received a wonderful new review the other day so thought I share with my readers. 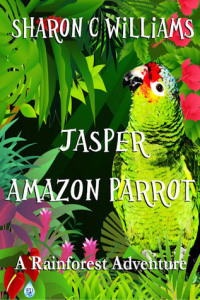 Good morning and welcome to this week’s edition of In the Books, featuring Jasper, Amazon Parrot: A Rainforest Adventure by Sharon C. Williams. Disclaimer: I was given a free ebook copy in exchange for an honest review. About the Book: Jasper learns the importance of family and friendship through a rainforest adventure. My Review: It’s been a while since I’ve reviewed a children’s book, but I have to admit this reignited the child in me. I really enjoyed the innocence of Jasper and his brother Willie as they grew and explored the world around them.